So, um, economics. In the State of the Union address this week, the president gave an optimistic assessment of the American economy (and America in general). In the latest GOP debate tonight, the candidates universally offered an apocalyptic rebuttal: an alternate description in which the country is on the verge of collapse. I can’t speak for most of America, but thought it might be worthwhile to share my assessment of the area in which I live, the Puget Sound region. Seattle’s economy right now is booming. In fact, it is booming so much as to basically outpace the ability of infrastructure and local governance to respond. The huge influx of people and money to what has become an exceptionally productive labor market has resulted in surging real estate prices, and tremendous strain on the transportation network. Most of this region was built under the vision of single family houses and private automobiles, and it seems as though under this current wave of growth we have crossed some sort of tipping point where that arrangement fundamentally doesn’t work anymore. So something interesting happened in Seattle this year, which is that the entire city council was up for election, thanks to a measure passed in 2013 to establish district candidates. The measure established seven districts, with two at-large positions filling out the nine member council. 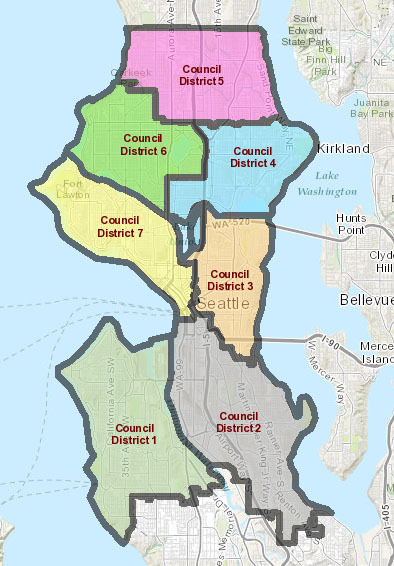 The map below from seattle.gov shows the locations of the new districts.